I’ve been looking at the diary for 2012. It is already filling up with the usual miscellany of consulting work, performances, workshops, travel, holidays and courses. It seems to happen like this every year. I want to live my life in a less fragmented way, with a greater sense that I am putting my time and life-energy into what really matters, but I find it hard to change the unconscious reflexes that trigger my responses to the world and shape what I actually end up doing. So before it gets too late this year, I am going to move the goalposts. Instead of starting by asking myself what I want do in the months ahead, I have decided to go back to basics and ask a different – and more fundamental – question: What have I come here for? Bill Plotkin (wilderness quest leader and author of Soulcraft) speaks of this as finding our soul-purpose. The soul already knows the answer if we can but listen, he says. But there are a couple of not-insignificant problems. First, if we pay attention to what the soul knows it may well turn our lives upside-down. Second, when answers come to us they do so in the form of images that are mysterious and cryptic. When they arise, we know they are significant but our rational minds find them difficult to decode. I have been living with just such an image for a decade or more. It slipped into my mind during a guided-meditation during a workshop called Stepping into Leadership with Henry V, run by my friend Richard Olivier. The focus of the meditation was our sense of purpose and we were invited to notice the images that arose. What stayed with me afterwards was a faint glimpse I caught in my mind’s eye of a five-bar gate, standing closed but unlocked in the middle of a sunlit field. 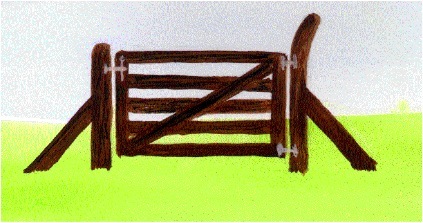 My purpose seems to be about unlatching and opening this gate so that I (and others) may pass through. In doing so we pass between worlds. Each time the gate opens we somehow subtly redefine our position in the world. We are renewed and the world changes. In Gestalt terms, they are “aha” moments that unlock old patterns of understanding and behaviour and open up new meanings and thus new possibilities for choice and action. Reminding myself of this insight twelve years later renews my sense of soul-purpose. I am an educator and the kind of learning I value is that which is life enhancing, increasing the possibilities for being and doing in the world and which also leads to a fuller expression of loving relationships. How I enact this purpose has changed over the years. I used to run leadership courses for police officers and civil servants; then I supervised PhD students; now I write, run workshops and tell stories. Now I have remembered what I came here for, planning what to do with my “one wild and precious life” this year suddenly seems both clearer and more demanding. Ah well – back to the diary.